Many companies both online and offline receive Non-Sufficient Fund check returns. Typically, those checks are resubmitted to the bank without verification causing unnecessary exposure to risk and high costs, specifically costs associated with check return and additional transaction submissions. 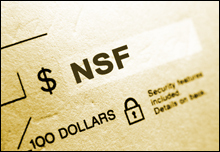 Using the array of Check Verification services, ATM Verify, NCN Verify and Live Verification, prior to resubmitting NSF transactions, merchants can validate the resubmissions, and upon success, initiate a debit.